While I feel it’s necessary for Twitter to continue rolling out new features that will make the Twitter experience more enjoyable, I have to wonder how many people will take advantage of Hovercards. For example, I access Twitter several times throughout the day and 90% of the time I am accessing Twitter from SocialScope on my BlackBerry. 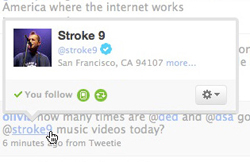 When I’m on the computer I am using TweetDeck to handle all my Twitter needs. It’s very rare that you’ll find me accessing Twitter via Twitter.com so Hovercards is not something I would personally find useful since TweetDeck has a similar profile option. There are many Twitter mobile apps and desktop clients out their nowadays so it will be interesting to see how this new feature works out.